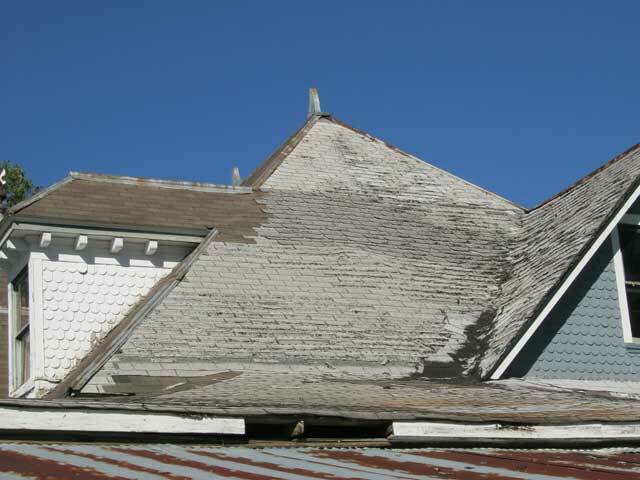 The many breaks and exposures (faces) present on a Victorian roof have advantages and disadvantages. Advantage: The design of the roof lends itself to economical repairs or partial re-roofing. In the event of damage or age, a single exposure or connecting exposures (in the case of a valley) can be replaced instead of the entire roof. For example, south or southeast/west facing shingles deteriorate 3-4 times faster than more northern exposures simply due to the sun. Also, severe storms in Texas…the roof damaging kind…approach from the northwest and most damage will be from that direction…or as often, just from the retreating direction as the outflows from the storm hit. Disadvantage: The Old Vic is a LOT of house. There is a LOT of roof. I count 28 exposures or faces. Most of the roof on the Old Vic is in good condition, having been stripped, decked, and re-roofed some time before we purchased her. In all those exposures…we have two minor leaks and that’s all. The southeastern roof exposure on the Old Vic. Time to replace. The top layer, I’m guessing 30 years old or so…has deteriorated to the point where I’ve got to do something…surprisingly there’s only a small leak here…but the condition of the roof prevents any effective repair. I inspected the roof closely when we were considering purchasing the Old Vic…and we budgeted for a complete new roof after 5 years, estimating we could get that far along. Turns out I was right…We will have owned the Old Vic five years this December…but the budget got shot clear to hell due to our government’s economic games, layoffs, pay cuts, MASSIVE insurance hikes (medical and homeowners), and the like…setting us years behind…but we will prevail of course. Time to strip, deck, and re-roof that area, as well as the lower-center exposure over the sun-room. The sun-room roof has been decked, but it was badly done, with no drip edging, and the decking has been damaged from the edges inward until it’s buckled. So off it comes, and new goes down. We didn’t buy the Old Vic to do quick fixes…so we’ll do it right…completely stripped, decked with actual plywood…repair all the facia, new drip edge, hail-wind resistant shingles etc. And, yep, I could hire a couple hands and go at it…but I’m not short-cutting on the Old Vic…so I would have to find/hire a couple experienced guys…ones that would actually show up and work hard…and since I’m not in the biz nowadays…I may as well hire an experienced crew and get it done with. I’m guessing around $3000…I’ve one guestimate that agrees with me…tighter quote coming. I don’t suppose y’all are ready to buy a couple million books? I don’t know about a “couple of million”; but I’d probably buy at least one IF YOU WOULD FINISH IT AND PUBLISH IT!! !